This review was written for the Egremont 2Day newspaper in August 2015. 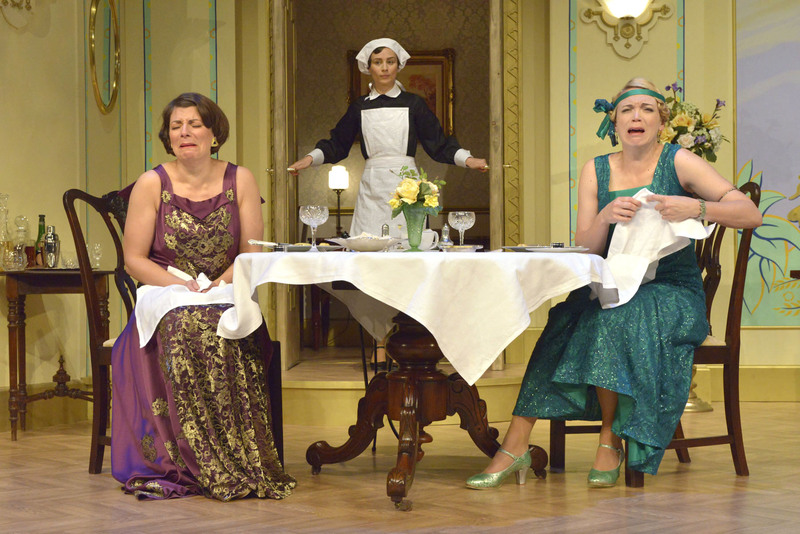 The cast at Keswick’s Theatre by the Lake continue to tickle the fancy of audiences with this third and last comedy of the current season. Fallen Angels is one of Coward’s lesser known plays but at the time caused shock and outrage with the critics – which of course made it very popular with audiences. For today’s audience some of the shock has gone as times have changed but the comedy value has been left entirely intact. This comedy relies on the ability of the actors to pull it off with just the right facial expression, tone of voice and delivery of lines; the cast at Keswick don’t disappoint. The play, set in the 1920s, takes place in one room of Julia and Fred’s flat in London. Julia’s best friend, Jane comes around in a flap after their husbands leave for the weekend; both girls have received a postcard from an old flame stating his intention to visit. What ensues is hilarious and cringe-worthy as the girls – equally terrified and excited at the prospect – drink themselves into a stupor and simultaneously a rage, and both their friendship and marriages are put to the test. Polly Lister and Frances Marshall, in the lead roles, were perfectly cast and their made their characters shine. Emily Tucker, whom I have admired greatly in her serious roles this season, proved she is just as good – if not better – in a comic role. I wish Coward had given more room for this character (Tucker plays the housemaid, Saunders) to do more and I was expecting a surprise to come towards the end which didn’t materialise. That’s Coward’s missed opportunity or perhaps it is just that Emily Tucker made the character so memorable that she gave more than the playwright could envisage for the role? Richard Earl and Jonny McPherson teamed up a third time to play the befuddled husbands – amiable, a tad pompous, but always ignorant of what their wives are, and have been, up to. These actors are a joy to watch and yet again are priceless even though their roles are smaller than in The 39 Steps. Director Ian Forrest has managed another great comedy on a par with his Abigail’s Party and I look forward to more of his work in the future. A special mention needs to go to the sound crew who do a great job with effects which have to be carefully timed. So good was the job that I’m still trying to work out if the actors really did play that piano or not!